Fish n’ Chips on the Corner, Hurrah! Over the 7 years we have lived on the Lower East Side change has been the one constant. We live on what I’d call the edge of the Lower East Side, everything further east from us is pretty much residential, the odd take away shop or grocery store, but nothing to indicate you were in the “hottest neighborhood” in Manhattan. The corner of East Broadway and Clinton, just to the east of our building, was, when we moved in, inhabited mostly by a large Bodega on the corner, for a brief while, next store a small shop sold wicker furniture. The first suggestion of real change was when Ramiken Crucible gallery opened up in the basement, followed by Dora coffee which then became Pushcart Coffee and by this time the writing was on the wall: East Broadway and Clinton was ready for its close up. Malt and Mold opened up selling a great selection of beer, including taps to fill up your growlers with. They also sell other snack items to go with beer most notably a good selection of cheese ( malt and mold a winning combo for sure). The bodega had to move to a smaller space so the prime corner location could make way for the newest addition to the ‘hood: Eastwood’s Chip Shop. Now all the storefronts along East Broadway in this one building are filled with interesting, hip, artisanal food/beverage places. In addition to fish n’ chips the take out part of Eastwood’s also sells falafel. They had initially been envisioned as a full service bar with food, but the community board put the nix on that so now they are more a restaurant who will hopefully in a few months time get a wine and beer license. They’ve done a great job with the space, a nice mix of modern and comfy, more importantly (if the fish n’ chips Neil brought home tonight is any indication) the food is really good and a much-needed addition to the neighborhood. I can’t wait to be able to sit in the lovely restaurant they have built and enjoy my food with an iced cold beer. In the mean time there is a small space to eat in and it’s a perfect take away meal midweek when you can’t even think about cooking. 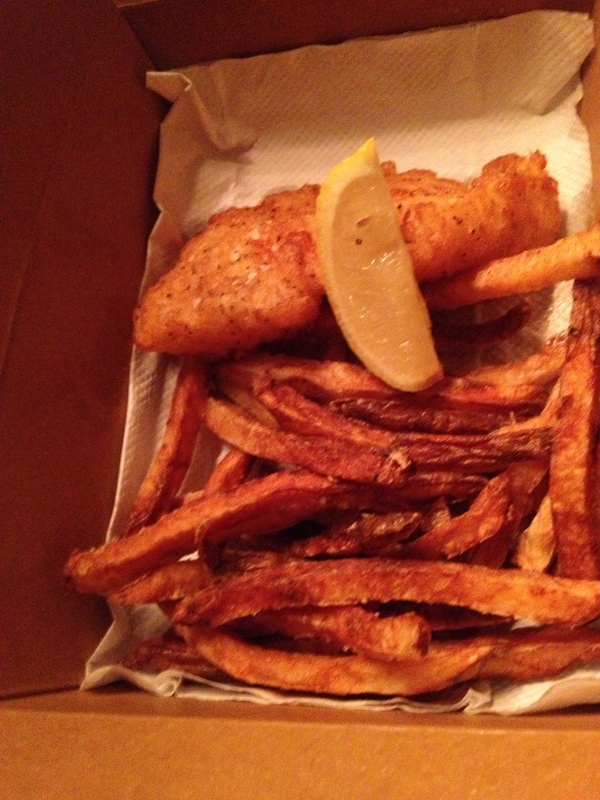 An order of Fish n’ Chips with 2 meaty pieces of fish is about $12. I’ll publish more of their menu items and prices soon. definitely check it out when you are on the LES! This entry was posted in Video and tagged Eastwood's chip shop, Lower East Side, Malt and Mold, Pushcart coffee, ramiken crucible, restaurants, the lodown. Bookmark the permalink.